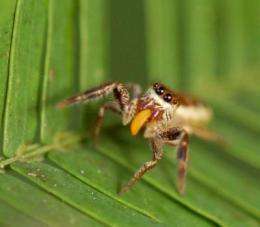 (PhysOrg.com) -- There are approximately 40,000 species of spiders in the world, all of which have been thought to be strict predators that feed on insects or other animals. Now, scientists have found that a small Central American jumping spider has a uniquely different diet: the species Bagheera kiplingi feeds predominantly on plant food. The research, led by Christopher Meehan of Villanova University and Eric Olson of Brandeis University, has revealed the extraordinary ecology and behavior in Bagheera kiplingi, which lives throughout much of Central America and southern Mexico. There, the spider inhabits several species of acacia shrubs involved in a co-evolutionary mutualism with certain ants that has long been a staple of ecology textbooks: the ants fiercely guard the plants against most would-be herbivores, while the acacias provide both housing for the ants via swollen, hollow spines and food in the form of nectar (excreted from glands at the base of each leaf) and specialized leaf tips known as Beltian bodies. The Bagheera spiders are "cheaters" in the ant-acacia system, stealing and eating both nectar and—most remarkably—Beltian bodies without helping to defend the plant. The spiders get the job done through active avoidance of patrolling acacia-ants, relying on excellent eyesight, agility, and cognitive skills. The researchers backed up their field observations with the results of laboratory analyses—conducted with the help of co-authors Matthew Reudink and Kurt Kyser of Queens University, Canada—of carbon and nitrogen isotopes for the various components of the ant-acacia system (Beltian bodies, ants, Bagheera spiders) and for other kinds of local spiders. 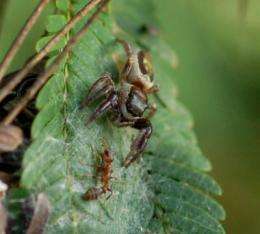 The ratio of 15N to 14N, which provides an indication of a species' trophic position, showed that Bagheera kiplingi was more similar to the herbivorous acacia-ants than to any of the other spiders sampled. Meanwhile, the ratio of 13C to 12C, which generally yields a match between an animal and its food, was almost identical for Bagheera spiders and the Beltian bodies. Collectively, the data show that Bagheera kiplingi obtains most of its diet directly or indirectly from the ant-acacia plants, especially in México. ...Utterly surreal. I knew that some mites were herbivorous, but other than them, I had been under the impression that chelicerates--all chelicerates--were carnivores, no exceptions, no gray areas, 'nuffin. To find herbivory in a SPIDER, of all beasties, is...Yikes. Amazing. Pretty complicated situation under which they are herbivorous, as well; generally, it's not a smart idea to meddle with the affairs of ants... And somewhat social, too!? It's like this species decided to completely flout all the rules of proper, upstanding arachnid behavior!